I'm at the College Book Arts Association conference in Iowa City this weekend. I don't have time for a comprehensive post, and you probably don't have time to read it; but here are a bits to munch on. John McVey shared some code books from turn-of-the-century telegraphy. I cannot underestimate how fascinating these things were. Lines and lines of code -- numbers and (usually nonsense) words -- paired with the phrase they represent. Of course, sending fewer words cost significantly less, so whole sentences were squashed into one word, with the shorter (and nonsensical) message being decoded on the other end. I think I may have seen Lisa Gitelman mention these at the English Institute in September (? ); but John shared a wide range, from code books for personal collections (complete with translations for the owner's favorite idioms) and did a nice job conveying the social environment in which these were used ("used" being the operative word -- many of the books are heavily annotated, and were most often used daily). He also painted a nice picture of that special kind of insanity (imagination?) 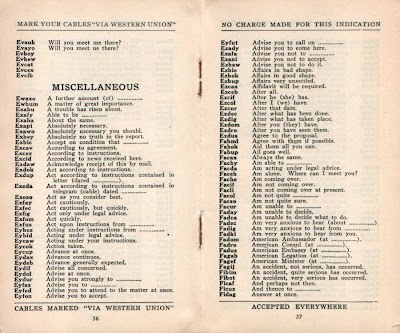 required of those who construct the codes -- and how they often get carried away, creating new words for every phrase imaginable ("I have been shot in the arm," "I have been shot in the leg," "I have been stabbed in the leg," "I have been shot and stabbed in the leg"). Anyway, it gets at all kinds of interesting notions of language, code and technology -- not to mention reference works and the utility of the book, or the potentials of the codex as index. And, best of all, he shared some of the telegraphs in code -- and guess what! -- they read like dada or fluxus poems. So many connections. 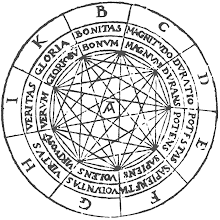 This all got me thinking a lot about spinning wheels or volvelles vs. the codex as a form for storing information. Obviously paper wheels and discs can store more information in a much smaller amount of space -- but the book can be more easily annotated and changed. (John shared a great example in which all "adultery" code words were rather angrily crossed out and replaced with something more chaste, like "ado.") I'd be curious if any wheels were used to find telegraphy codes. 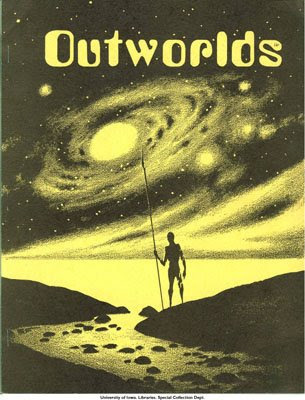 Also, briefly: Gregory Prickman shared some sci fi fan zines from the 1930s, using them to talk about different kinds of social networks that build up around the book (or any technology). 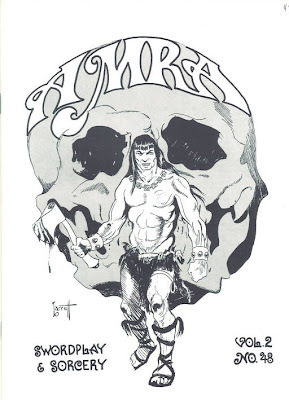 Apparently the University of Iowa has quite a collection of these early zines -- and, I just discovered, many of the covers are digitized. Boy, this is a CMS thesis just waiting to be written (if it hasn't been already). 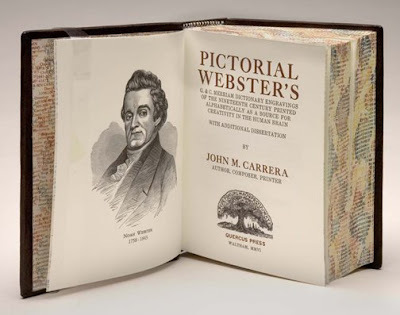 The Pictorial Webster's is, in simplist terms, an artistic visual reference of what was important to 19th Century America.The 400 plus page volume is printed with the original wood engravings and copper electrotypes of the Merriam-Webster dictionaries of the 19th Century; namely the 1859 American Dictionary of the English Language (the 1st illustrated dictionary in America), the 1864 edition of that same Dictionary, and the 1890 International Dictionary. 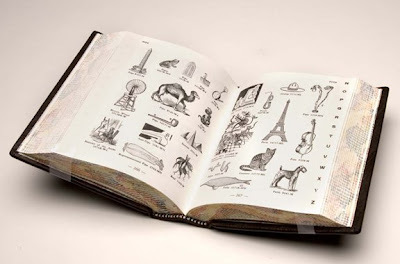 The Engravings are arranged alphabetically, a system of organization long shunned by lexicographers because alphabetical order grants no intrinsic meaning to any given grouping of words, but it is perfect for a book that creates its own immersive experience in imagery of a time gone by. I share a kind of unhinged intimacy with dictionaries, particularly with the play of sound and image in dictionaries (my coffee table is pasted with images and entries from an old Funk & Wagnalls). The Pictorial Webster's captures this intimacy so well -- that is, the sense that the very same artificial and arbitrary systems that attempt to organize (tame) language in a lexicon also render it a playground rife with freewheeling pattern associations. And, of course, it is absolutely gorgeous. Layers of words printed in different colors form the marbling on the edges and endsheets. So beautiful! In short, lots for this lover of big, fat reference books to enjoy today.